Super Hero Boy: Teaching a three year old manners is hard, Barney can help! Teaching a three year old manners is hard, Barney can help! Connor is almost three and he has suddenly jumped ahead in his use of words and how he plays. I swear I blinked somewhere and my baby became a full fledged preschooler in a matter of days. The only issue is the closer he gets to three the more I'm starting to see the attitude that comes along with it. The biggest problem we are having as of late is his ability to share and to ask other children to do things "nicely". Usually when he does get around a group of kids his age or close to his age he starts making demands like he is some sort of small dictator. Thankfully Barney's new Please and Thank You dvd may just teach my child a lesson in manners. 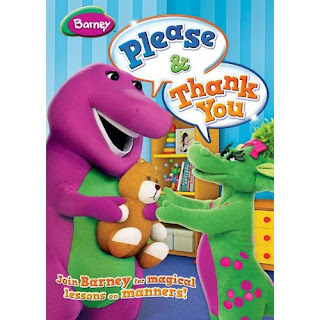 Three Barney and Friends episodes are included on Please and Thank You. Including Magic Words, Tea-riffic Manners and Caring Hearts. As well there are 20 new songs included all about having good manners, being helpful, cleaning up, and learning to play together. All skills that I know most preschoolers need, heh.. the question is can Barney teach husbands too? I'm also super excited to say that like the Thomas dvd we just reviewed there are two dvd games included on this disc as well Cakes, Cups and Colors and Alphabet Cookies which deal with colors and the alphabet. Connor is pretty good with his colors but we need serious help with the Alphabet so I was super glad to see those and even more excited to see dvd games that are in his age range. You can get Barney's Please and Thank You right now on dvd and pick up your own on Amazon!